For a decade across the 8 and 16-bit generations, Mega Man had been an action-packed dynamo, but after some twenty odd games, his aging framework was in need of some vital upgrades. Powered by the PlayStation hardware, Keiji Inafune and his crew of robot masters successfully forged a new Blue Bomber, translating his action concepts onto a three-dimensional world. The new 32 bit tech gave the series a chance to break away from the techno-future aesthetic found in both the Classic and X series with their cities dependent on robots for manual labor. Mega Man Legends is an adventure in a world covered in endless water where diggers explore the ruins of a lost civilization amongst the scattered land masses for Zenny and treasure. Functioning as a tutorial scene, the game’s opening site introduces amnesiac metal boy Mega Man Volnutt and his mechanical genius adopted sister Roll. There’s an interesting dynamic between the two partners: safely aboard the families airship the Flutter, Roll monitors Mega Man as he explores, offering support and teaching you the basics of the gameplay. In many ways, Mega Man moves like any typical 3D game, but it’s with the camera implementation that the control comes into its own. By mapping Mega Man’s horizontal orientation to L1 and R1, the designers were able to approximate a version of circle strafing in a time before dual joystick controllers were the standard and months before Ocarina of Time would revolutionize combat with Z-targeting. It might have taken a little practice, but mastering these controls provides a fluidity of movement that allows the game to stay true to its action roots while avoiding the slight disorientation to the environment outside your field of view that comes from moving outwards from a focal point. With the dungeon’s energy shard under his arm, Mega Man sets off on the Flutter. Of course, it’s not long before they find themselves stranded on the lush Kattelox Island and swept up in a race against the infamous sky-pirate Bonne family for the mythical Mother Lode, the vast score of every digger’s dreams hidden somewhere underground. High quality production values bring the story to life. Aside from the playful voice acting afforded by the move to CD’s, the smartly designed animation system overlays sprites on the polygonal character models to give its characters a large set of complex expressions. It’s an aesthetic that takes advantage of the PlayStation’s technology while utilizing the techniques Capcom had cut its teeth on in the previous generations. The blending of old and new graphical styles paints a living cartoon, a spirited steam punk adventure that calls to mind Hayao Miyazaki’s ‘Castle in the Sky’. The comparison between Legends and Miyazaki’s animated masterpiece is just as fitting as the originals were to Osamu Tezuka’s manga milestone Astro Boy. As any fortune loving pirates, the Bonne’s are more than eager to break the law to sate their greed. With the hot-headed Tron, the cunning Tiesel, the modular Bon and their army of cute, Lego-people-esque Servbots, they carry their weight through a fun story spread from the oceans around the island to the skies above. And Kattelox is a place full of life. What starts as a small town blossoms into a city bustling with activity. From the hustle of the business district to the refinement of the harbor to the warehouses of old town, every block has points of interest; the museum in need of new pieces for its collection, the kids who want a clubhouse to call their own and the pulpy case files at the Police Station. Through your actions, Kattelox will change in ways that few games do, but not always for the better. Take an early mission where Mega Man has to stop the Bonne’s from destroying the government facilities at the north end of town. Framed as a live news cast that cuts between the action and destruction, you need to destroy all the attacking bots before they level every building, the progress of which is updated by the reporter’s narration. After the battle, the ruined buildings become unusable, their content unavailable until you’ve donated enough Zenny for the locals to rebuild. For several hours of playtime after, those buildings are replaced with large containers for the reconstruction, reinforcing the town’s infrastructure and your attachment to the island. The mechanical sensibility carries over to the character growth. For weapons, it starts with modifying the Mega Buster’s base attributes. By purchasing new parts or having Roll develop from various scavenged items, your arsenal not only becomes stronger but greatly expands. A single special item can be equipped and each is incredibly different from one another, be it a rocket launcher, arm-mounted shield or vacuum. Traversal is augmented by finding the parts necessary to jump higher or quickly skate around town. The decision to make many parts simple household items that can be found in everyday locations adds character to the society and people. But beneath the modern culture there is history. The various dig sites reveal a network of interconnected passages, forming an enormous labyrinth to be explored and plundered. But roving their halls are the mechanical ghosts of time long ago. These reaverbots help portray the industrial aesthetic. While it’s hard to qualify the need for robotic snakes and dogs, the enemies are often designed to appear like they could have functional significance, constructed from bulky technology that has a rusted, metal composition and emit the sounds of creaky pistons and hollow echoes of furnaces. There’s a stark contrast to the opposing nature of the environments above and below ground: where the fields of Kattelox are bright green and the oceans surrounding it a deep blue, the dungeons are a rusty brown; where the surface is cheery, inviting and fresh, the depths are oppressive, hostile and stagnant. The ruins feel like old factories compared to the more efficient models found above ground. As your rivalry with the Bonnes escalates, you become more and more aware that maybe the secrets of this lost civilization are better left undiscovered. You uncover why at the end. The final dungeon back on line, our blue hero meets a new threat: Mega Man Juno. This powerful mech reveals that Mega Man had been a trump card created to cleanse the human population and decides it’s time to finally carry out its last orders. It’s here that the story works into the franchises larger fiction. The over reliance on its automation had put the old world through upheaval and war and forced the people to seal away their mistakes. If Mega Man Classic is a light tale about technology run amok and X looked at the nature of life and freedom, Legends is about starting new by looking back at our history and learning from it. Not only will you find the metaphor in the story, but in the application of the technology used to tell it. 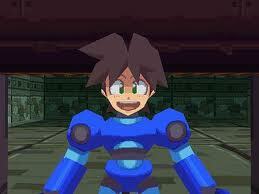 Since its release in 1998, Inafune has made it known that Mega Man Legends holds a special place in his heart. Looking at the game, it’s not hard to see why; with its colorful, vibrant land and heroic story, Mega Man Legends is a game about constructing a future from the blueprints of the past.